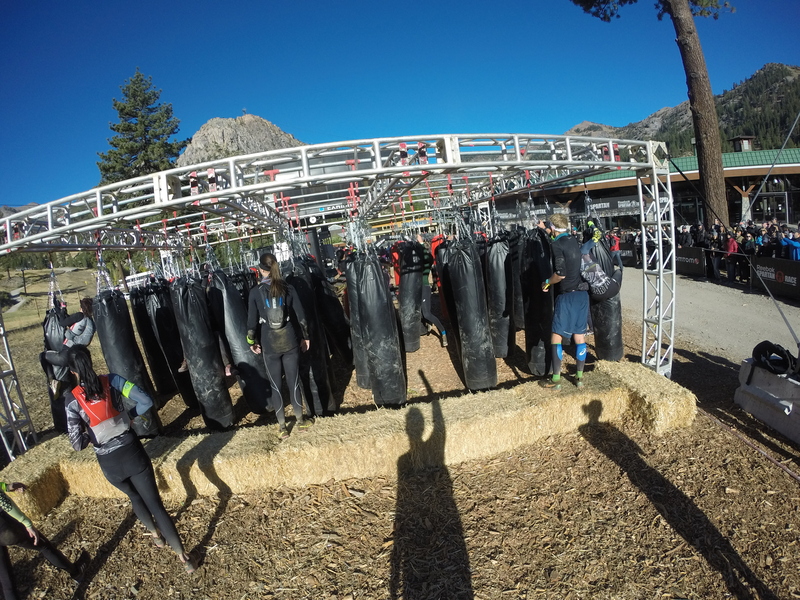 It's 7:30 on a very crisp Saturday morning in Lake Tahoe, California, and I'm standing in a group of athletes listening to announcers call up some of the biggest names in OCR: Robert Killian, Hobie Call, Hunter McIntyre, Ryan Atkins, and so on. Shortly after that, the group surges over the wall into the starting corral. So how did a 46-year-old Clydesdale with bad knees who could only break a 7-minute mile if he was falling off a cliff end up in such speedy company? 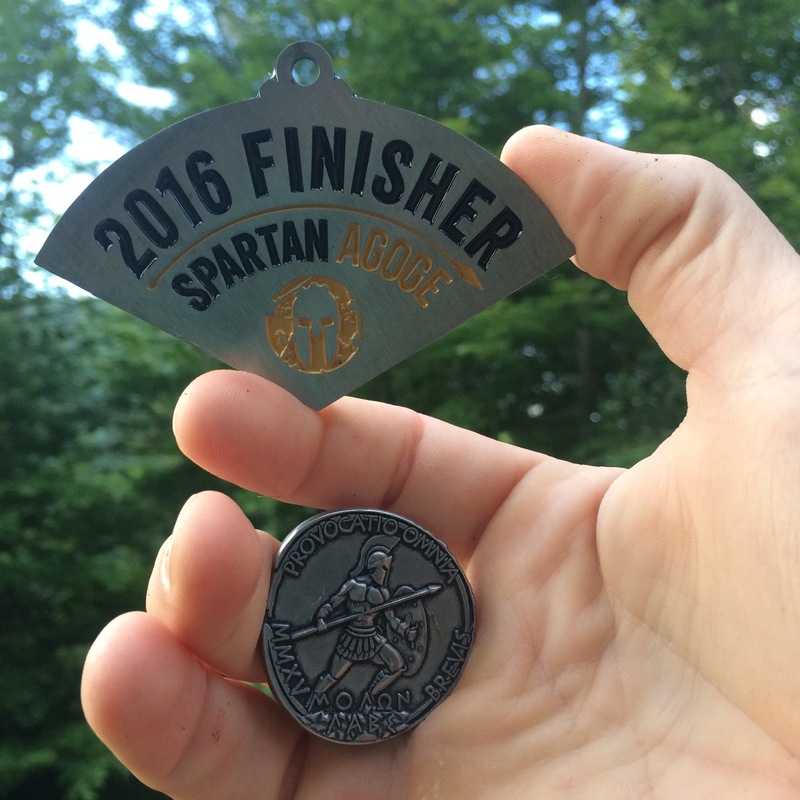 It turns out that there was an alternate way to earn a WC coin this year; a few were given out during the Spartan Agoge I attended in June, and I was fortunate enough to be awarded one in that event. These coins were given out in recognition of your contributions to the team environment and recipients were chosen by their teammates. 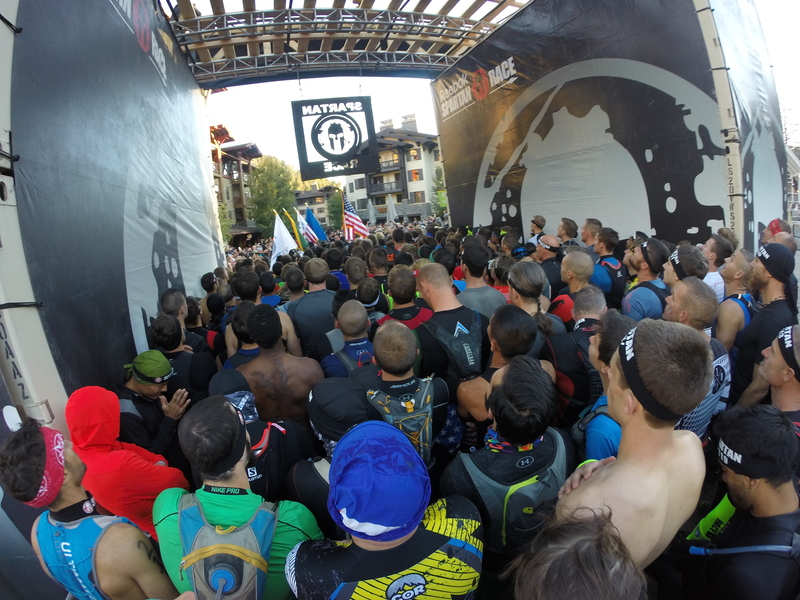 Since they weren't given for the same reason, there was some question whether or not the coin was actually an invitation to the World Championship Heat or was merely symbolic, and indeed there were differing statements from Spartan Race staff at different times on the topic. Eventually, it was confirmed that a coin was a coin, and I was welcome to take on that challenge. 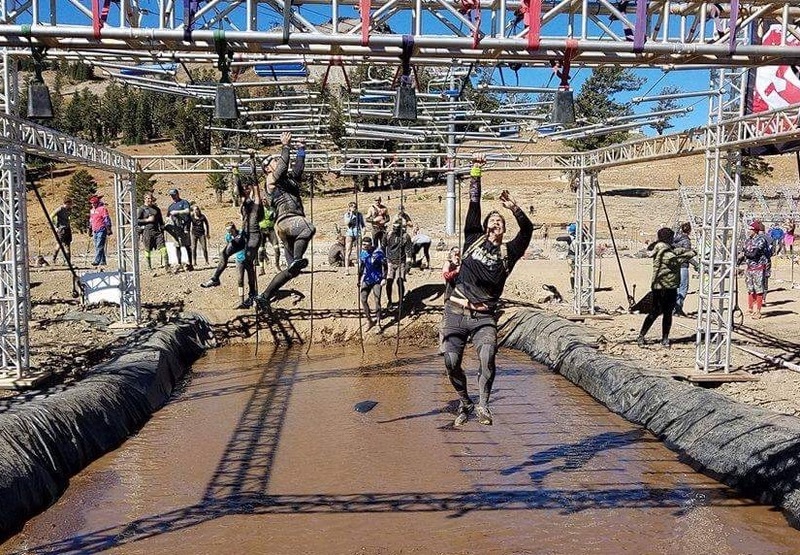 By the way, did I mention that this would also mark my first time ever running in the Spartan Elite Heat? Go big or go home, right? I jumped at the chance. 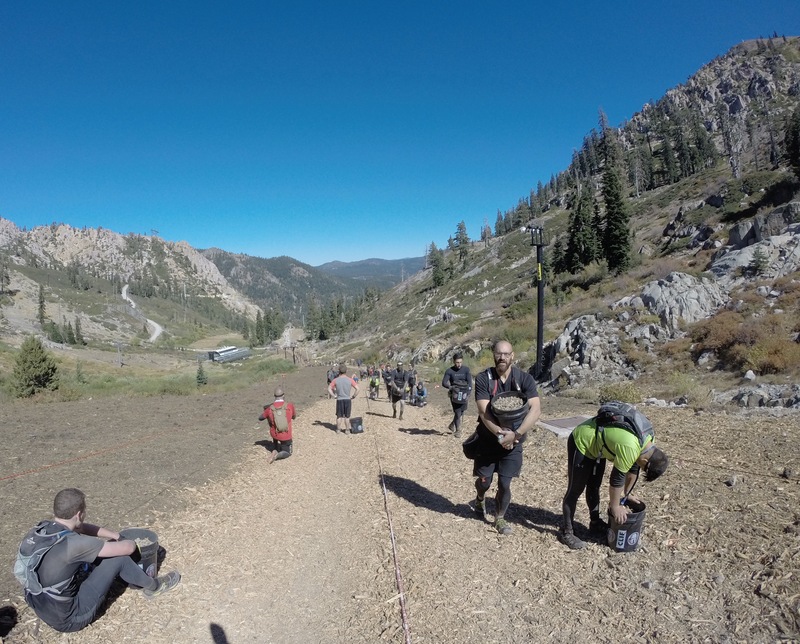 Most of my Agoge brethren who were in Lake Tahoe opted for the Ultra Beast instead, so I'm reasonably certain that I'm the only one who used a coin earned at Agoge for the World Championship heat. The only tortoise in a big pack of jackrabbits, in other words. The course started out with a flat run through the Olympic Village at Squaw Valley and through the parking lot to the first obstacles, a standard O-U-T and rolling mud. Soaked to at least the waist right off the bat; thanks Spartan! Then the ascent of the first peak started. By 1/2 mile into the race, the rest of the male elites were out of sight, and I enjoyed a peaceful power hike up the trails and the fire road to about the first water station, where the top female athletes from the 2nd World Championship heat started catching and passing me. There goes Lindsay Webster, with Rose Wetzel a little bit behind her, and many other strong, fast women whom I don't recognize on sight. As we finally crest the first big hill after at least one steep false peak, the main pack of female athletes running for the money has caught up to me. A slip of my hand on the Monkey Bars, and I'm off to the side doing my first 30 burpees of the day on an obstacle I usually conquer easily. Then I head back down the mountain along some rocky single track; it's at this point that I'm passed by the first male elites from the non-money heat. So far though, I'm feeling pretty good. The sun is out, the day is glorious, and I'm in a spectacular setting. At the bottom of the hill we come to the first new obstacle of the day; the Thigh Master. For those who haven't seen it, it consists of 5 heavy boxing bags in a row hanging from swivels, and you need to traverse the bags without touching the ground. Pretty easy really, especially when I got the idea to hook my arm through the chain to the elbow, saving my grip strength for later. That done, I climb over the inverted wall and start heading up the big mountain. I arrive at the Cargo Net A-Frame, and right beside it see ominous piles of buckets and dirt. But more on that later. Instead, after the A-Frame the road leads up and around to the Spear Throw, high on a shoulder of the mountain and exposed to strong gusting crosswinds to make it tougher. I throw my spear in a perfect toss that veers about 6″ left of the hay bale, and then proceed to eat dust as I knock out my next 30 burpees. Once done, I dust myself off and head up the track, which winds through a rocky scramble before coming out around the gondola level. First up, the new Olympus obstacle, which closely resembles BattleFrog's (RIP) Tip of the Spear, but is actually much easier with a multitude of options for your hands to grab. As I finish the plate drag and Atlas Carry and start heading up the road, my legs are paying the price for a lack of distance training (as a result of prior knee issues) leading up to the event. After the long climb my quads are protesting, and multiple muscles on both legs start cramping at once. I shift from a fast hike to a slow hobble, then sit for a few minutes, waving away concerned athletes. I take some mustard in the hopes that it will alleviate the cramping, and continue, despite fantasizing about catching the gondola back down to the festival and calling it a day. 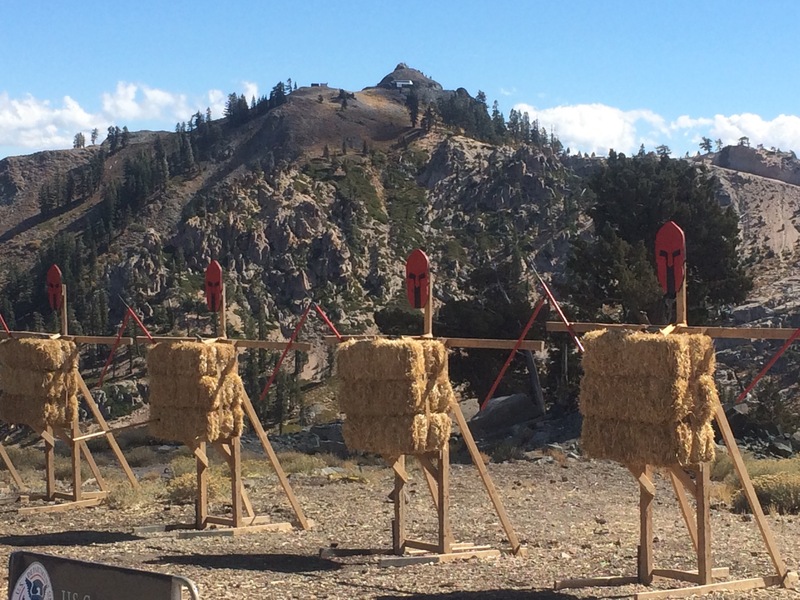 As I get to the new Spartan Ladder obstacle, I take another break, sitting on a hay bale and digging the points of my elbows into my quads to get them to relax. Up one side, down the others then the Tyrolean Traverse and I get to rest my legs for a bit with a nice long, very dusty double barbed wire roll. 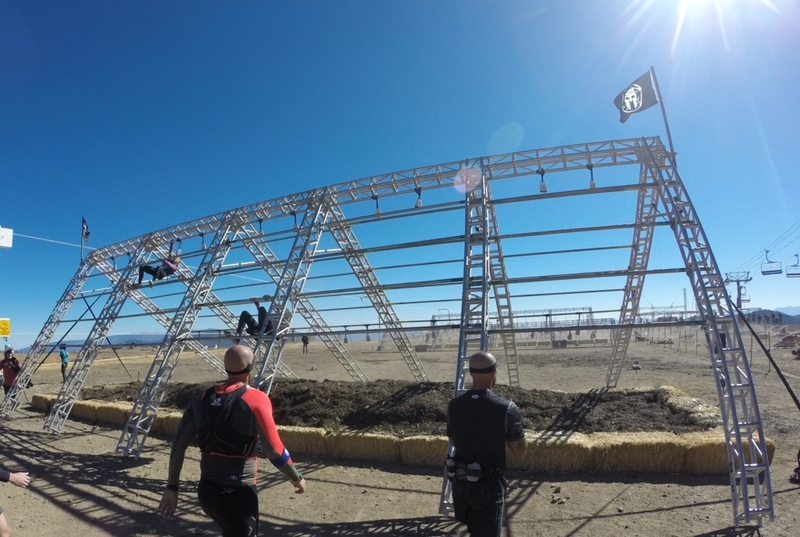 Next up, my most anticipated obstacle of the day, the new (for me) Ape Hanger. Climb a rope, traverse across a loosely hanging metal ladder, and ring the bell before dropping into the water. I'm able to get onto the ladder and start across. Midway I miss my grab for the next ladder rung and have to reset, losing all my momentum, so I had to do a dead-hanging pull-up to reach the next and highest rung. After that, it's mostly downhill, and I ring the bell happily before dropping into the knee-deep water. Oh good, we're starting to go down the hill now. Just kidding, here's a double-sandbag carry back up to the summit and down again. After multiple breaks along the way, as I run into more friends on the course (and by run into, I mean say hi as they pass me looking fresh), I finally give the sandbags back. A quick log-flip, and now I'm at the infamous swim. I've been dreading this since last year, when the frigid water combined with wind and a cloudy day had us flirting with hypothermia for the next few miles. Forewarned, I came prepared this time, and quickly stuff my shirt and a windbreaker into the dry bag I'd been toting inside my hydration pack. The swim was just as cold as I remember it from last year, and once done, I hurriedly put on my dry clothes and grab a snack of sriracha-honey bacon. I'm not irresponsible enough to tout anything as a cure without a lot more research, but that day, on that mountain, this was apparently exactly what I needed, and the cramps that had been plaguing me for a couple of miles eased and disappeared enough that I could actually bring my speed up to a steady trot down the single track once we passed the log carry. After a few more obstacles, I arrive back at the buckets and dirt that had been sitting there so lonely as I started up the mountain earlier. 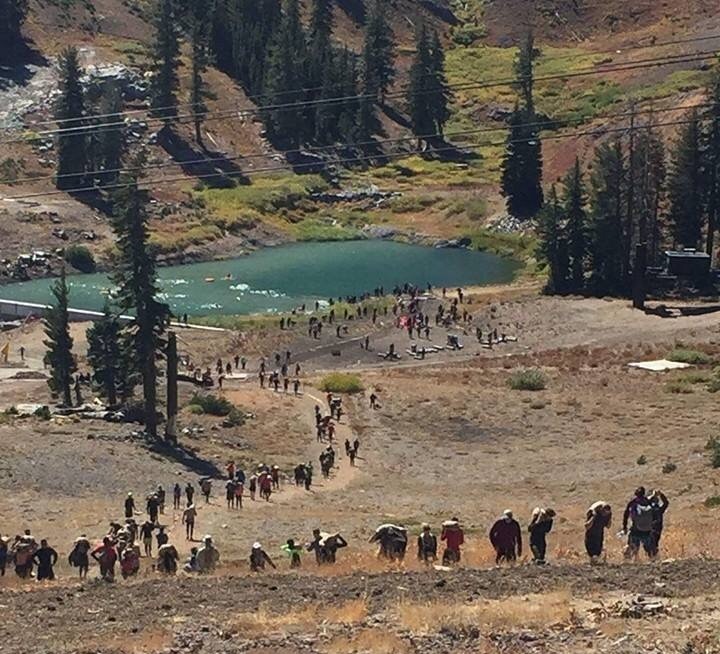 It wasn't lonely anymore; now a steady line of athletes were heading up the long incline with their buckets in hand. At mile 13, this was rough, and I made frequent rest stops along the way, putting my bucket down and taking advantage of the makeshift seat it provided before getting up, picking it up, and moving another fifty paces or so. After what felt like an eternity, I finally get the bucket back down and am able to pour the dirt back out for the next poor chap to use. Thus lightened, I start back down the path, jogging again and even passing a person or three along the way. 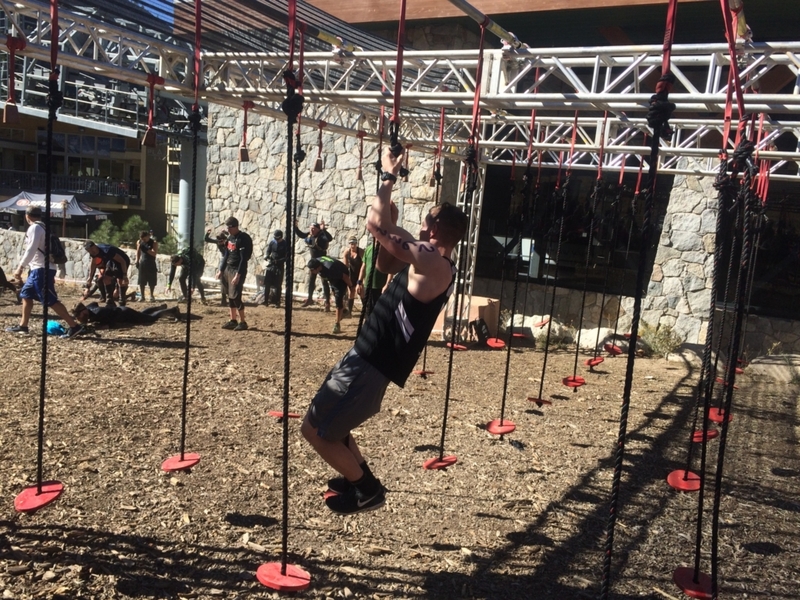 As I arrive back in the festival area, I get the first great news of the day; as an Elite competitor (I use the term loosely, but I did have the bracelet), I get to skip the balance obstacle and go straight to the Herc Hoist. I grab a rope, sit back and start pulling, and about halfway up, my grip starts slipping. That's ok, Spartan has a new rule on the Herc Hoist allowing multiple attempts, so I gingerly lower the bag and dig through my pack and the dry bag inside it to get my gloves. Gloves on, I do the Hoist again and this time my grip is much better. Phew! Now wade into the pond and get chilly again going under the dunk wall. Up and over the slip wall, and I'm on the final approach. 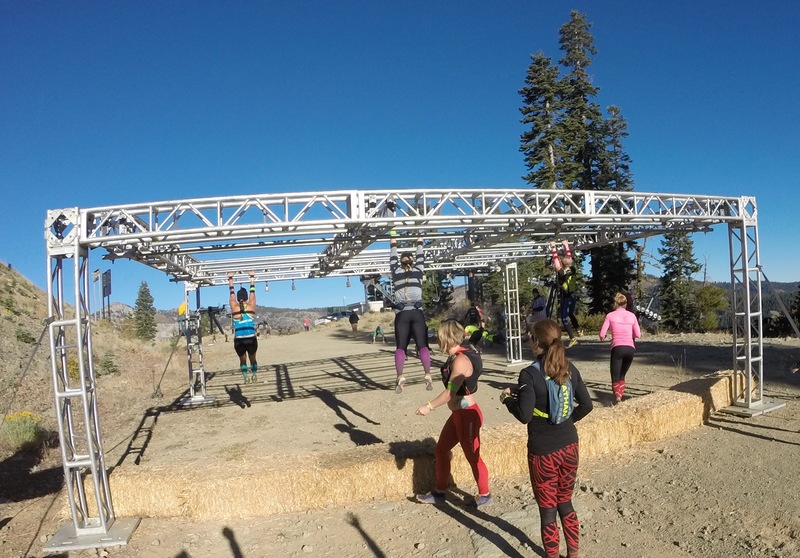 Over the Spartan bridge, climb the rope to ring the bell, and now for the Spartan Rig. This one was longer than usual, but actually looked very do-able, consisting of several rings to a bar, and then ropes with boards on them to give a narrow foothold on each before ringing the bell. I shake out my forearms a little, and start swinging on the rings – one, two, three, and slip. Damn. With the Finish Line right THERE, I move to the side and slowly crank out my last 30 burpees of the day before collecting my finisher's medal. Later, I check the results tent, and find out that I didn't win the race after all. In fact, it took me nearly 3 times longer to make my way through the course than the Victor Hobie Call, and of those who finished, I was DFL (dead f'ing last) in my heat. As a runner and a Spartan, I was completely outclassed and had absolutely no business being in that heat. Indeed I was nowhere near the shape I should have been in for that race, and the mountain made me pay for it with muscles that are still sore and tender as I write this two days later. But. If you were given the chance to go to the Olympics, would you take it? Obviously you know my answer. Saturday's Beast, with me running in the World Championship Heat, will remain forever in my memory as the grand adventure that it was. AROO! AROO! AROO! You completed it! good job, that a very fun race. glad that we missed cold the next day. Great article. I really felt like I was there with you. I’ve been living vicariously through all the reports comming through as I was unable to make it from New Zealand. Your account of the race was very enjoyable and honest. Thanks for taking us on a very personal ride. A real and raw article. Great job on the finish.